A few usefull things I'd like to share with you that in my experience make adventure travel all the more fun. Click on the images to get more information or to purchase. You can use the Solar 'AA' Battery Charger nearly anywhere you go, camping, fishing, boating, etc. Times do vary depending upon the strength of sunlight or the depth of discharge of the batteries. The adjusting flame control on this stove make the extra few dollars every bit worthwhile. 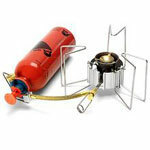 Multi-fuel backpacking stove easily adjusts from a slow simmer to a rolling boil, in any temperature or altitude due to the precise flame control. An invaluable reference tool for everyone, whether novice or experienced, who wish to venture in to the hills in safety. navigation, camping, expeditions, weather and leadership. A vast array of techniques and essential information. A real boy scout gadget this one. A superb fire igniting tool with a magnesium and flint strip. Performs well in wet conditions, cold temperatures, and high elevations. No more setting your self on fire as you try to light your stove! and the flint sparks can be seen from 3 miles away at night! I use this as a grill for anything from toast to squid. The stainless steel gauze heats rapidly enabling toast to be browned extremely quickly. You use it on a fire or stove and it folds flat for easy storage and transportation. I've always travelled with a telescopic rod and this one is about as good as I've seen. It is very light, versatile and capable of holding on to the bigger surprises. Good for on and off-road adventures , the Yak's low centre of gravity, narrow profile, and versatile capacity, enables you to travel in style while getting the weight off of their bike's frame. Use the Yak for self-contained trips into the backcountry. You'll still need your map and compass though this gadget will increase your confidence and could help get you out of a spot of bother quickly. This new all-in-one navigation device is the first combination GPS, altimeter, and electronic compass. The electronic compass provides bearing information when you're standing still and the altimeter determines precise altitude, so you can tell how high you've climbed and your rate of ascent. Been really impressed with the versatility and control of the Nikon Coolpix 990. Its exceptionally well-designed user interface and controls and 3.34 megapixel sensor delivers 2048 x 1536 images. Ive had some excellent results, most of the pictures on this site have been generated using this camera. N.B. Dont skimp out on memory if youre traveling with a digital Camera. I have a 200mb Compact Flash which gets me by and I down load via an external USB Compact flash device. 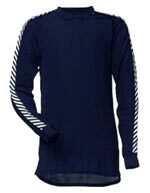 We wear this base layer all the time, depending on how cool it is, long or short sleeved. It is versatile in its performance for all outdoor activities, keeps you dry, regulates body temperature and is odour resistant and comfortable. Cant recommend it any more. This gadget is the way forward if you just need to have music with you when you travel. Mine is the 6GB version, I can fit about 150 CD's on here and there is a 20GB version out now. Very simple to load copy CD's, you can even update on the move in internet cafes. With this sort of flexibility you never get bored of the same tracks. I love these shocks, they give superb flexibility. The Psylo SL gives you RockShox's U-Turn spring system that switches the travel from 80mm to 125mm. It also has the Climb-It Control, which locks out the suspension completely - really useful for climbs and grinding it out on the road. Speedometer, Odometer, Altimeter - this ones got everything, time temperature, barometer, combined altitude gain. It's fun to see some of the statistics for all the hard work you put in. Its reassuring to know you are still going in the right direction and particularly useful when trying to find you way around and out of cities. Extremely lightweight. It's a little filter that's huge on value and versatility. No other filter available offers the field maintainability of the MiniWorks filter that's why it was selected by the Amphibious Raids & Reconnaissance Division of the U.S. Marine Corp as the filter of choice for fast-and-light missions. 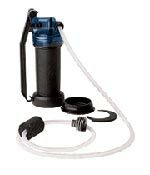 The Mini-Works filter is ultra compact, light, easy to use and can go with you on short day hikes and multi-month international treks. 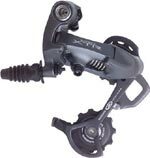 If Q was building James Bond a bike hed spec it with this derailleur. Superb reliability. allows you to alert and interact with people as youre passing by in a wonderfully nostalgic and traditional manner. Ring-ring-ring!